I started out as a fan of Beck’s Guero and Sea Change albums, and I was discovering Beck’s catalogue. I browsed through his name at the local record store and came across Stereopatheic Soulmanure. I hadn’t heard of the album, and at first I was skeptical it might be an unofficial bootleg pressing, but I decided to take my chances and made the purchase. The clerk who sold me the album asked me if I’d heard it and assured me that it was “lo-fi, but a good album.” I liked the term “lo-fi,” but admittedly, I didn’t know that lo-fi (in this context) was referring to low resolution tape recordings. I listened to the CD in my car on my way home and was initially disappointed and confused. The opening track, "Pink Noise (Rock Me Amadeus)" is a dissonant and raucous noise rock song that I couldn’t picture Beck writing. There’s roughly fifteen minutes worth of noise rock tracks in lieu of the opener, and about eighteen minutes of country-folk ballads ("Row Boat"). The rest of the album consists of fragments of field recordings, samples, live performances and home recordings. With the seemingly random displacement of the track listing, this album was going to take some time for me to digest, but there was something about it that intrigued me. I grew to like the album not necessarily for the songs, but because it’s an entertaining and often hilarious listen. When I heard "Rollin’s Power Sauce" playing in another room, and all I could hear was a sporadic and incomprehensive screaming. It made me laugh pretty hard as I pictured some mentally unstable guy screaming angrily at the top of his lungs for no reason. The album humorously flows like a bad mixtape intercutting between nonsensical blurbs and songs. The dated tracks (8.6.82) are playfully fragmented voice memos using a microcassette dictation recorder: “We were smoking a lot a/whiskey/and uh, chicken.” A likely highlight for many is "Satan Gave Me a Taco," which is a wild drug-tinged folk venture, or the lap-steel driven country tune "Row Boat," which Johnny Cash himself later covered. "No Money No Honey" sounds like Beck encountered a homeless man named Ken who could manage a song or two and recorded it on a portable cassette machine, and I imagine it being a Fisher-Price model. The "Bonus Noise” material at the end is basically a reel of experiments and what appears to be abandoned backing tracks, which serves as an interesting insight although it isn’t too pleasant on the ears. 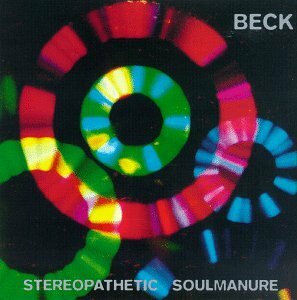 The strength of Stereopathetic Soulmanure lies in Beck’s ability to create curious and candid feeling moments. There’s an effortlessness about Stereopathetic that is infectious. One can feed off the creative energy and raw sensibility that Beck has in using whatever is in reach to his advantage. Beck goes no further than where he is to do what he does and Stereopathetic is case-in-point to this notion. From an artists’ perspective, Stereopathetic Soulmanure serves as an inspiration and reminder to celebrate even the garbage one creates. It’s just plain fun to listen to experimentations that would later be developed and refined, and would eventually pay off in his more renowned works such as Odelay.